For me, Japan was one of those alluring, enigmatic places I always wanted to visit. The colourful and dizzying Japanese culture, with their obscure hobbies and language of symbols felt like another, almost mythical, planet. When I finally made it to Japan, it did not disappoint. But Japan isn’t the easiest place to plan a trip to, I had a basic Tokyo, Kyoto, Osaka itinerary in mind but wanted to make sure I didn’t miss any hidden gems that I could also see in a Japan 2 week itinerary. This year, the Rugby World Cup 2019 is being held in Japan. 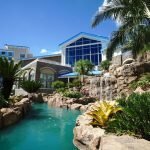 If you were lucky enough to get tickets to a game or just want to be in town to soak up the incredible atmosphere, there has never been a better time to visit. The home nations are playing in cities all across the country and this Japan 2 week itinerary incorporates the main tourist highlights as well as a few pointers on what to see and do if you’re in town for a match. Japan is an exciting destination but it can be overwhelming if you’re trying to plan a trip and you have never been before. 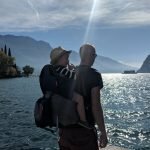 I was traveling with my two friends and gradually we cobbled a basic Tokyo, Kyoto, Osaka itinerary, throwing in a few other stops we’d either read about or were recommended. Before he starts trashing me on social media, in the end Luke Chilton was largely responsible for this itinerary, but it’s a good one. If you are going to Japan for the first time, for the RWC2019 or for the Tokyo 2020 Olympics and you want a decent two-week itinerary Japan of the main players and a few cheeky extras, this is the plan for you. 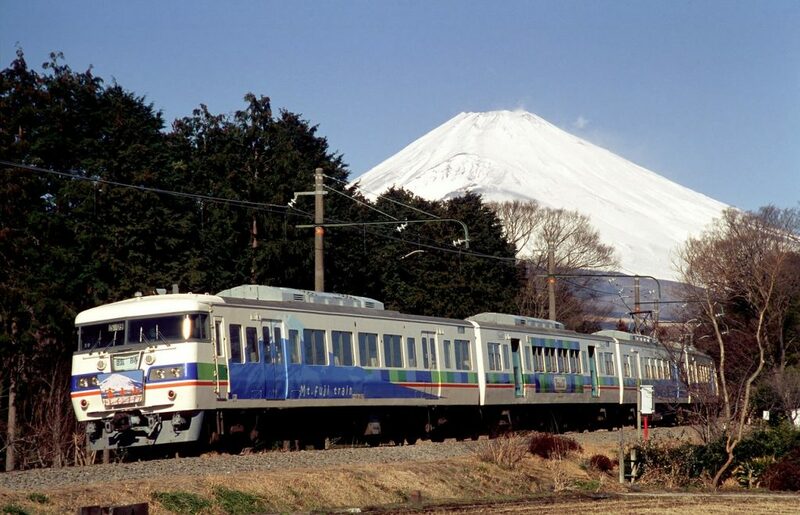 If you want to see as much of the country as possible, in the easiest way possible, the best way to get around Japan is by train. Trains in Japan are superb! They are really easy to use with signs, maps and destination boards in both English and Japanese. They are also very punctual, frequent and clean. Plus, everyone on them and at the stations is ridiculously polite and helpful. 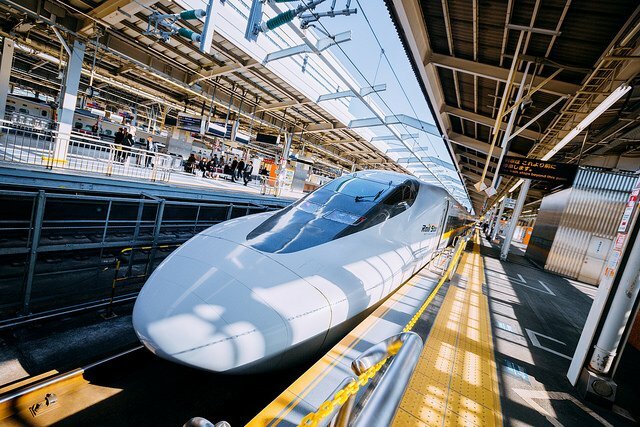 They are also the quickest and most convenient way to travel the country, especially on the speedy Japanese Bullet Train, the Shinkansen, which goes up to 200 mph. The most important thing you need to know before you travel is that you must buy your Japan train tickets in advance online at a Japan Rail Pass UK official office. This is down to a government tourism initiative. The discount Japan rail travel tickets cannot be purchased in Japan, even if you are a non-resident. To be honest, we were really unsure about this when started planning our Toyko Kyoto Osaka itinerary. For the JR Pass, you have to fork out £319 (for a two week pass) and the website japantravel-centre.com that sells the official tickets looked very basic and scammy… However, friends who had been to Japan assured us that this site was to be trusted and they were right, we had nothing to worry about. Our JR Passes, which include the bullet train, arrived in the post two weeks later. 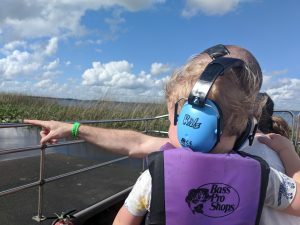 Don’t lose your pass – as far as I know, they are not replaceable! Scheduled flights from the UK most commonly arrive in Japan in the morning Japanese time. For this reason, and to help combat jetlag, it’s best not to cram too much into your first day. Once you have checked into your hotel or AirBnB, take time to rest before going for a wander in your local area to get a feel for Japanese life. Jet lag from UK to Japan can be brutal so I recommend trying to fit into local meal times straight away, even if you are not hungry. Grab a quick lunch in a rice or noodle bar. 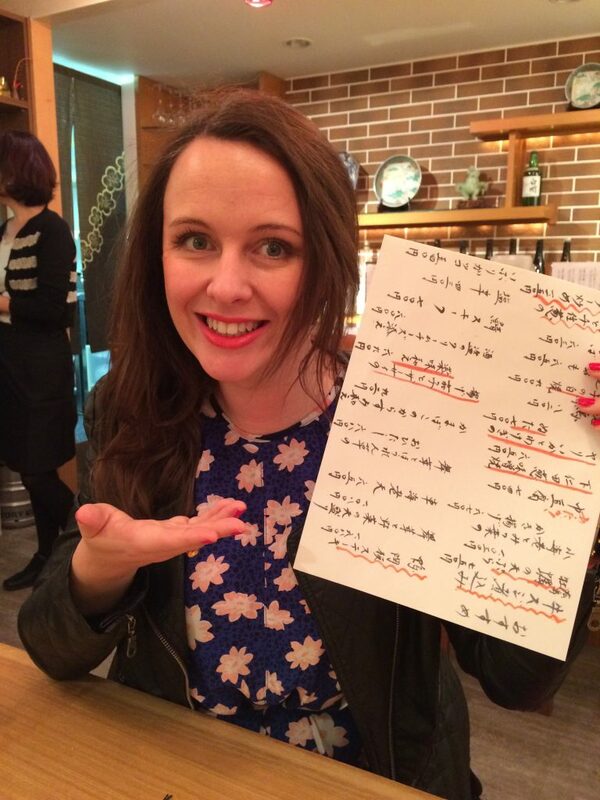 It’s worth writing down the Japanese for common ingredients like chicken チキン Beef牛肉 or vegetable 野菜 or anything you definitely don’t like, because even in areas that seem touristy, it is unlikely staff will speak or understand English words and the English alphabet wont be used on the menu. 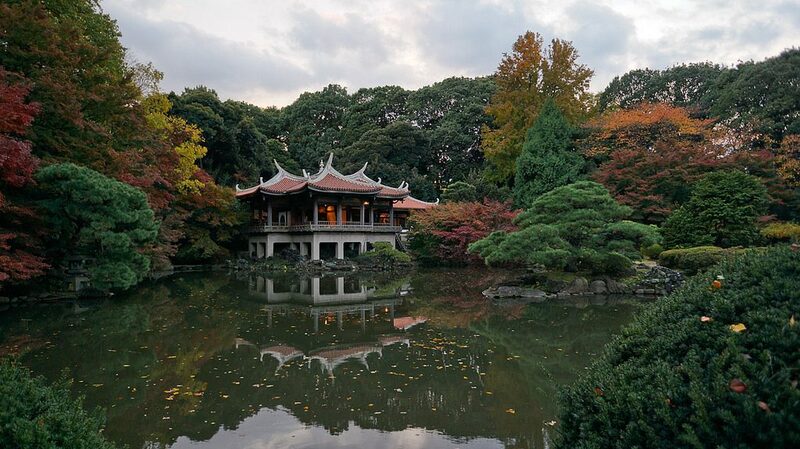 In the afternoon, go for a walk in the Shinjuku Gyoen. The botanical garden has native plants and trees as well as international foliage, monumenrts and sacred areas. There is a small entrance fee but it’s a gorgeous place to spend the afternoon, even if you are jetlagged. Don’t miss the Taiwan Pavilion in the national garden, surrounded by a beautiful koi pond. For animation fans, this park was the inspiration for the award-winning Japanese film, Spirited Away. Opposite the park is the Shinjuku area, with shops, chain restaurants (if you’re already in need of a hamburger) and high-end department stores. There is also a huge pharmacy here where I picked up all my favourite Japanese beauty products! After a quick browse and some dinner, head back for an early night. If you’re anything like me you’ll be super tired by now and tomorrow is an early start! The fish market was worth the early call time. 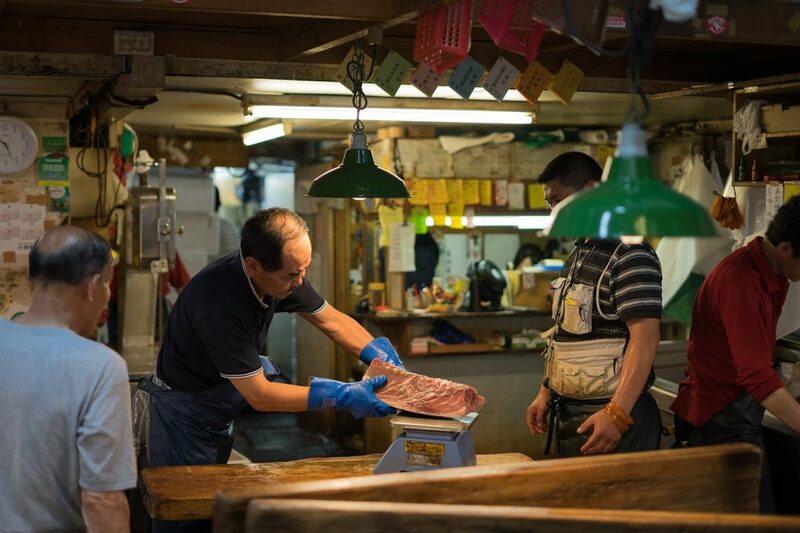 Last year, after three or four years of threatening to, the famous Tsukiji Fish Market closed to the public. This is such a shame as it was one of the truly authentic and interesting places to experience in Tokyo. Even though the main market hall (inside) is now gone, the Tsukjii Outer Market of higldy pigldy shops, great sushi bars and stalls will give you an idea of the old charm of the trading hall. The famous Tsukiji Tuna Auction now takes place at the relocated location, Toyosu Market. From this month, the famous Tokyo tuna auction is now open to the public in its new home, which is quite exciting. Despite the new market being more sterile and less cinematic than the orginal location (which was open for 83 years) it is definitely still worth visiting the Toyosu market. 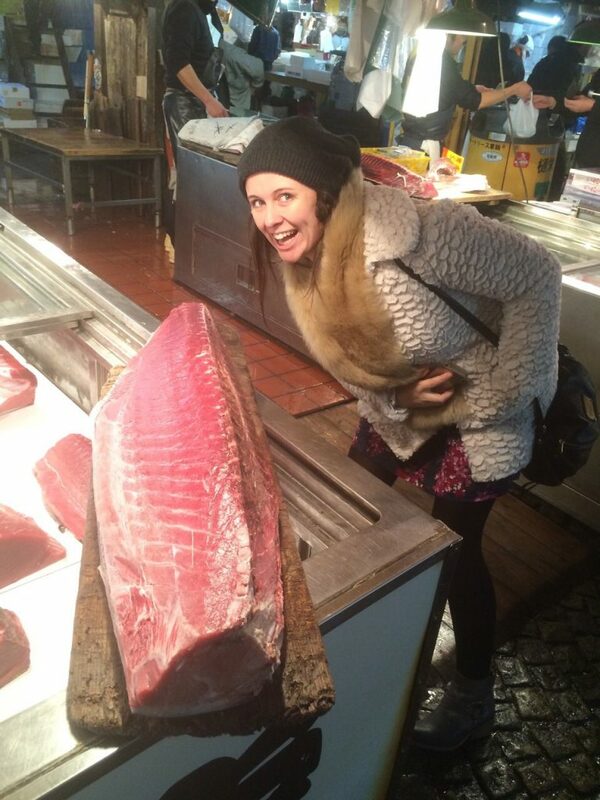 Just seeing all the huge tuna laid out is quite the spectacle. The average Bluefish Tuna sold at the market is around 380kg, selling for up to £4000, so it’s not your everyday fishmonger. In January 2019, the market launched to a fanfare when a giant bluefin tuna sold for a record £2.5m (333.6 million yen). It apparently weighed a hefty 278kg (43.7st)! After the auction, you can walk around the market to browse and sample the regular fish and seafood. You can also dine on the freshest sushi in Tokyo! The market starts trading from 5.30am to 6.30am so get there early to get a really good view. There is an open public viewing gallery above the trading floor that can get very busy, so aim to arrive as early as possible for the best views. 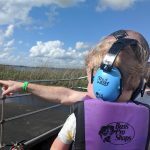 There is also a purpose-made observation deck that is much closer to the action but visitors must apply on the official site for a place on the deck. The form in English is the last form on the page. Applications are open for a week, the month before you plan to visit (so if you want to go in April, you will need to apply during the open application period in March). 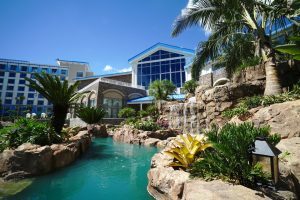 It’s free, but applying doesn’t guarantee you a place on the deck, you will be entered into a ballot system and, if successful, offered a ten-minute slot on your chosen day. If you are happy to watch the auction from the public viewing gallery, you don’t need to make an application in advance. Just turn up and get yourself a good spot. 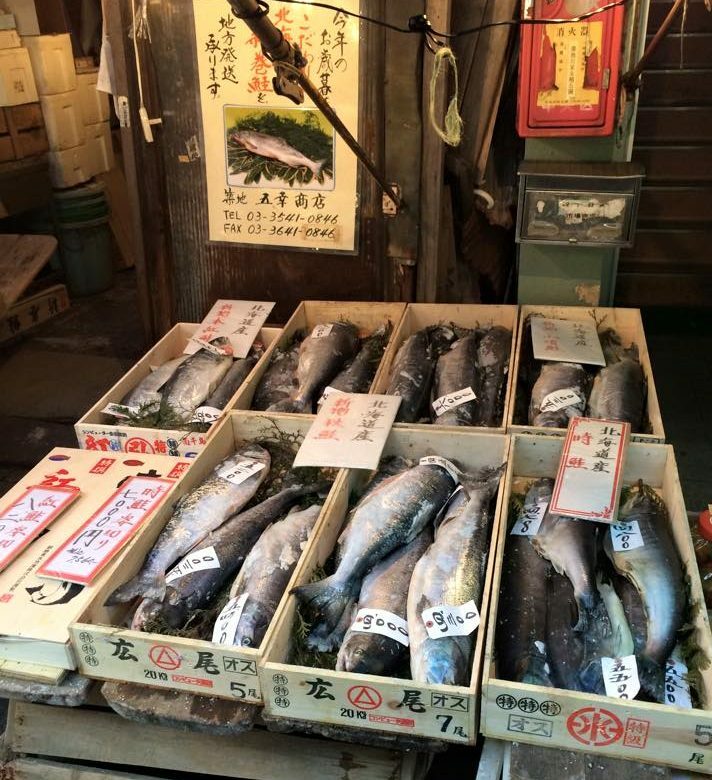 Bring layers, the new market is kept very cold to maintain the freshness of the fish. 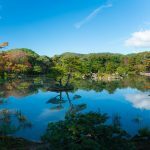 If you are looking for other early bird things to do in the morning in Tokyo, check out this fab post by our friends at Differentville.com, who also have some great ideas for quirky and weird things you can see and do in Tokyo. In the afternoon, try out some less fishy retail therapy with some of the best shopping in Tokyo. Ginza Six, (or The G SIX to those in the know) is a huge, gorgeous shopping mall with everything from handmade cashmere boutiques and high end stores such as Gucci, Dior and Shiseido to bookstores and places to get holiday souvenirs. There is also a huge food hall and lots of restaurants and coffee shops. My favourite was a home store on the top floor where I got some gorgeous mugs, place settings and ornaments. The mall is probably the most fashionable place I have ever been to – but not snobby or pretentious so you’ll be safe in your tourist threads. 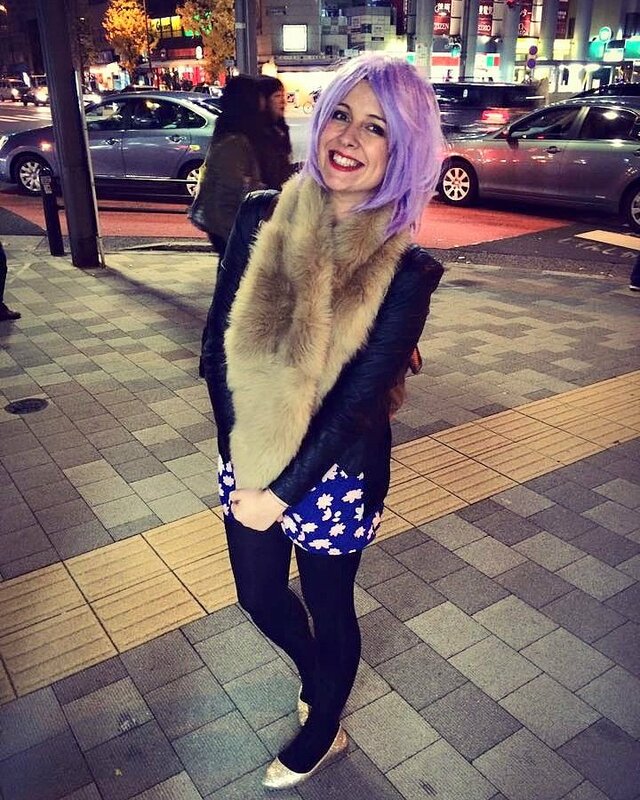 For style of a different kind, check out the Harajuku shopping area. Wild costumes, ridiculous shoes, fluffy backpacks, twee phone accessories and pretty much everything you can think of with Pokemon or Hello Kitty on it. This is also a key area for cult sneakers or collectors items. If you’re looking for some cool vintage finds, best place to head to is Shimokitazawa, a full-on hipster zone with some of the best vintage in the city. Just bear in mind Japanese sizes were even smaller in the 50s and 60s so make sure you try on! 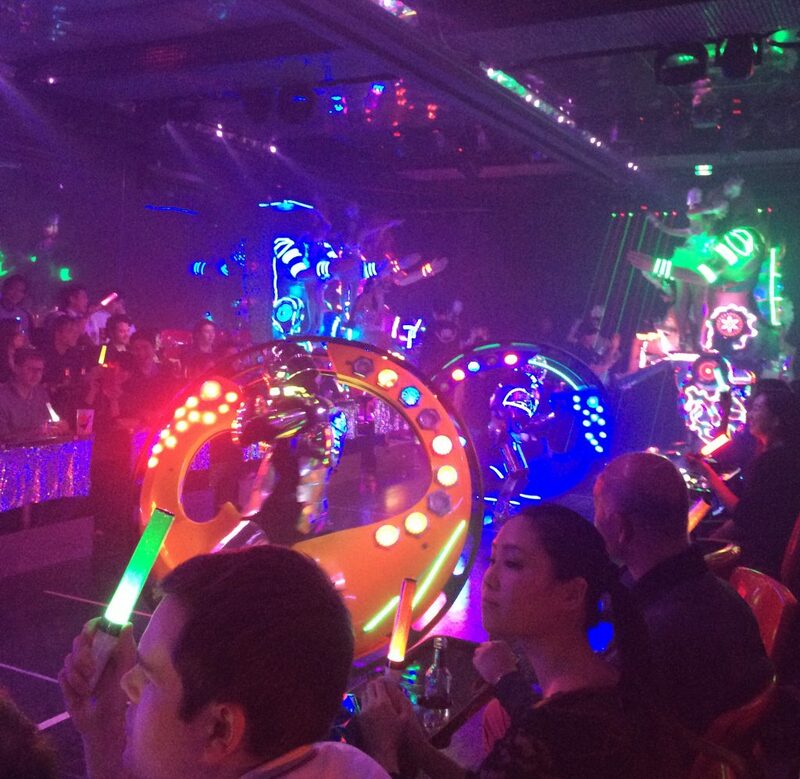 I expected Japan to be surprising but, I think the nightlife was the biggest shock of all. The Japanese are so polite, cultured and well mannered, but man they like to drink! 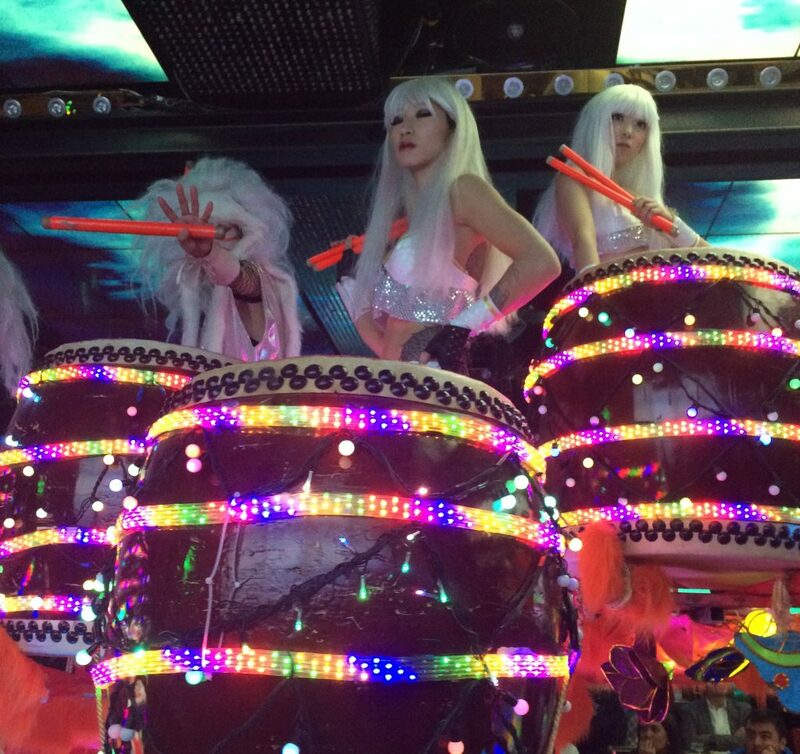 If you are looking for party, there’s a party atmosphere on virtually every night! 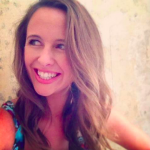 From karaoke bars hidden in office blocks (so ridiculously hard to find I can’t even point you in the right direction), to teeny tiny gin bars, whisky huts and fancy cocktail clubs – I’d say there was something for everyone in Tokyo. 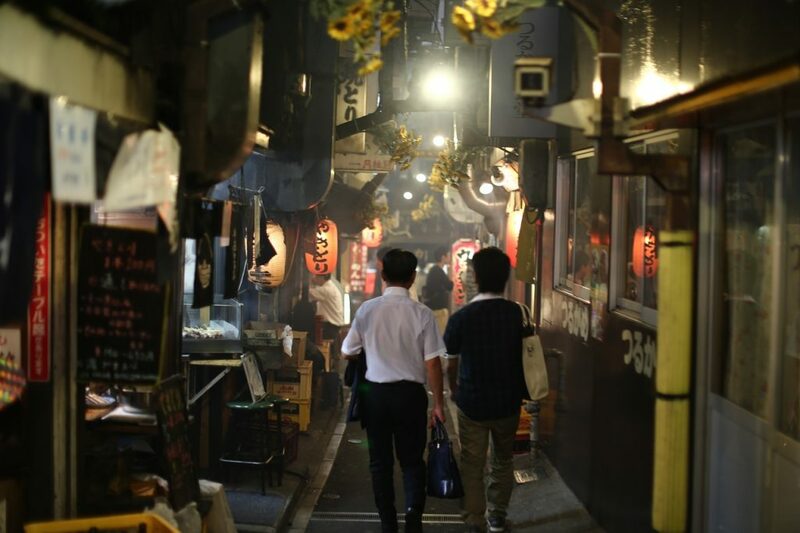 By far, my favourite area to go out was Shinjuku’s Golden Gai. Essentially, this used to be Tokyo’s red light district and now it’s a collection of tiny bars all seating no more than 25 people max, but the majority probably only squeezing in up to 10. Most welcome tourists, although some do have a notice on the door saying ‘locals only or no visitors’. Don’t be afraid to poke your head in to see if there are any seats and you’ll soon be told if your face doesn’t fit (in a nice-ish way, of course!) We met a lot of friendly bar owners / bar tenders, locals and other tourists here and had a great time. This also seems like a great time for a quick mention of the Japanese ‘kebab’ – otherwise known as the Katsu Chicken. 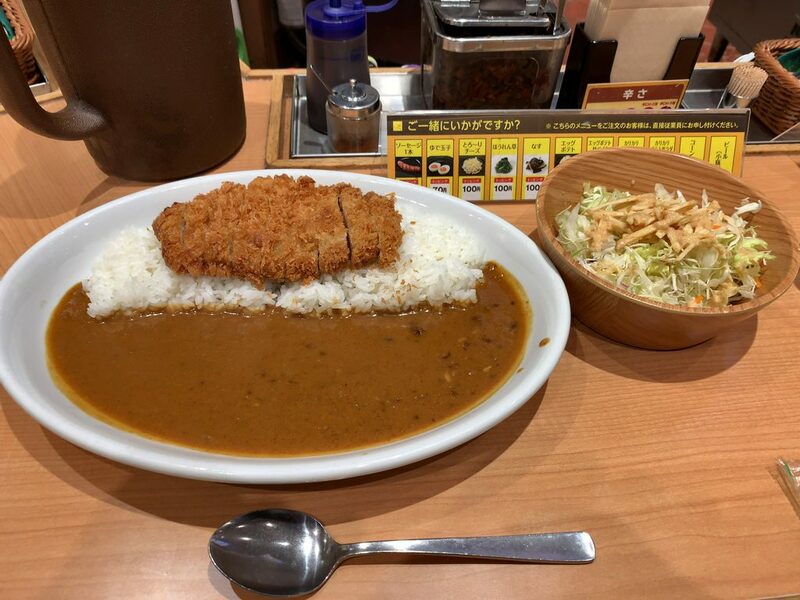 Instead of a dirty kebab after (or during) a night out, in Japan it’s all about a Katsu curry pitstop. There are Katsu shops everywhere and, yes, they are more delicious than Wagamana! The train to Mt. Fuji is super cute! With your pre-purchased JR Rail Pass, board the JR Tokaido line heading towards Kozu from Tokyo Station. This will take around 1hr 15 mins. At Kozu (sometimes labeled as Kanagawa), you will need to change trains to the local JR Gotemba Line for Numazu. The second part of the journey takes around an hour. Get off at Gotemba Station. Our hotel stay included a free transfer pick up from Gotemba station. We adored this hotel, which had stunning views of Mt Fuji from our rooms. We purchased a full onsen package which means the per night cost includes breakfast and dinner. Our room was a Japanese-style room with mountain views and an open-air bath which was well worth the extra spend. Guests have full use of the Onsen (spa) and as traditionally the case, male and female bathing is separate. I loved the authentic Japanese robes that were hanging up ready for us in the rooms. It really makes you feel like you are getting a real experience. You can also pay extra for services such as massage and reflexology to be done in the comfort of your own room. We paid £401 between three people. If you are not in Mt. Fuji to hike (hiking on the mountain is only accessible from July to September), the area is mostly a chilled out beauty spot with not much else to do. On the other side of the hotel is the vast Lake Kawaguchi. You can walk around the lake and you will find small boat charters, local shops and restaurants. For the best views of the lake and of Mt. Fuji, take the Mt.Kachi Kachi Ropeway, a cable car that lifts you up to near the peak of Mount Tenjo from the Eastern Shores of Lake Kawaguchiko. The ropeway costs £5.50 for a round trip per adult. At the vista point there is an ice cream shop and a small park where you can ring the ‘love bell’ with your beau and wish for luck in your romance. Here is the best place to get photos of Mt Fuji but bear in mind, because of the height of the mountain, the peak is often hidden by cloud. We didn’t realise this and it was only when we posted our photo to social media we were inundated with people saying how lucky we were! Take the local JR train from Gotemba to Odawara station, this takes around 1hr. Then change for the Shinkansen (bullet train) to Shin-Yokohama Staion, which takes 50 minutes. If you are visiting Japan for the Rugby World Cup 2019, many of the home nation games are being played in Yokohama. This city is a less frantic, calmer version of Tokyo with a beautiful waterfront. 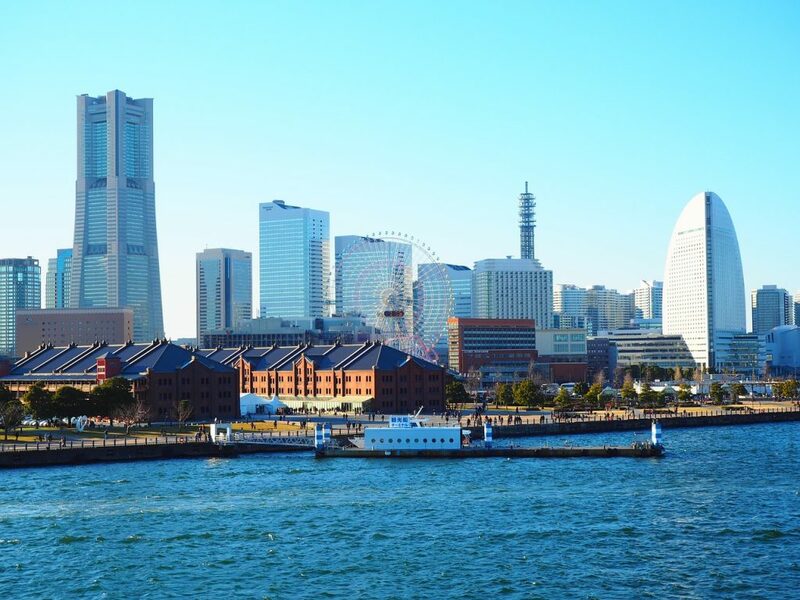 Head first to Yamashita Park, which is situated on Yokohama Bay along the water’s edge. 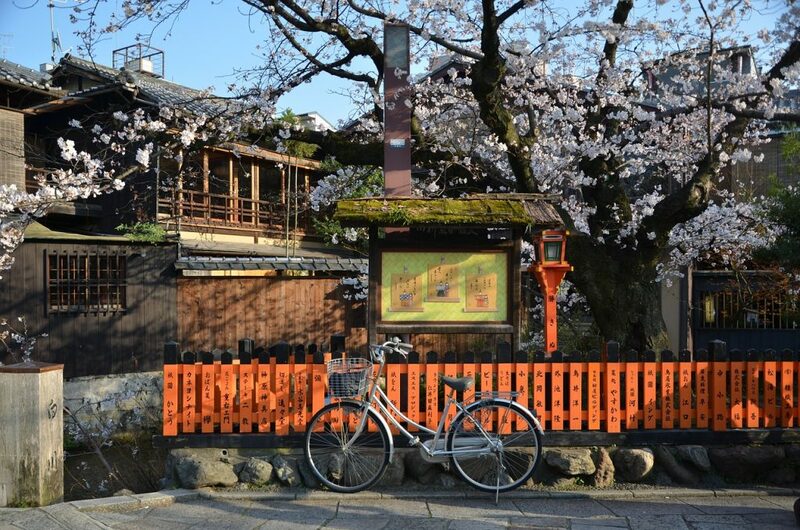 This is popular area for locals and a great way to immerse yourself in modern Japanses living. Highly recommended is a tour of the Hikawa Maru Ocean liner (£2.50 entry fee). Built in the 1920s, the ship, which once sailed Charlie Chaplin onto Japanese shores, is now a floating museum showcasing decks and cabins exactly how there were during her maiden voyage in 1930. For lunch, rather excitingly, you can visit the Shin-Yokohama Ramen Museum, or accurately, Raumen, which sells different flavours and cooking styles of ramen from all over Japan and the world. Our favourite was the Muku Zweite pork bone and soy with rich noodles, but try a tapas of mini sized ramen from a few stalls to make the most of the experience. In the afternoon, have a wander around the city and head to the The Bluff to check out the Yamate Western Houses. You can also take the train to Ishikawacho Station and the houses are all walking distance from there and from each other. 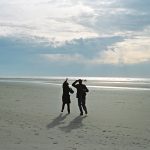 You can take organised walking tours or just find your own way. The unusual architecture (for Japan) was built by international settlers in the early 1600s but much of the area was destroyed during the Great Kanto Earthquake in 1923. 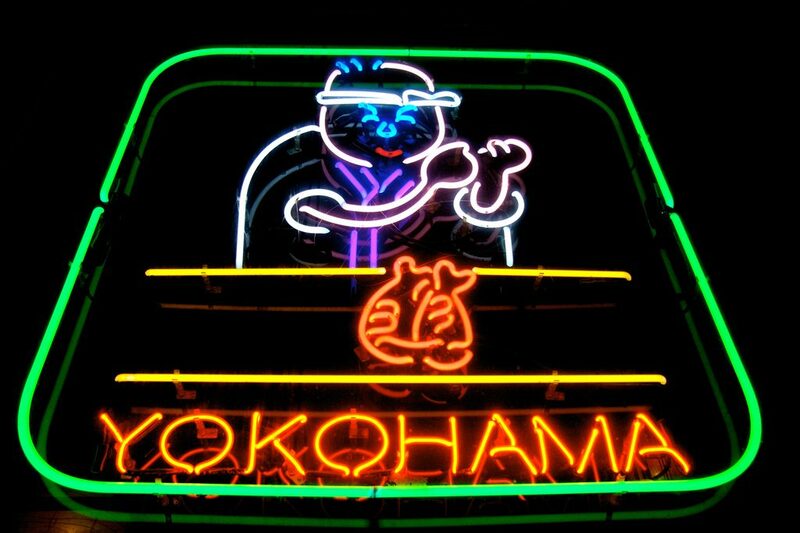 Even though Yokohama is smaller than Tokyo, the city does have a diverse nightlife. For fancy cocktail bars and hotels (such as the sleek Bar Noble), the Minato Mirai area is the place to head. 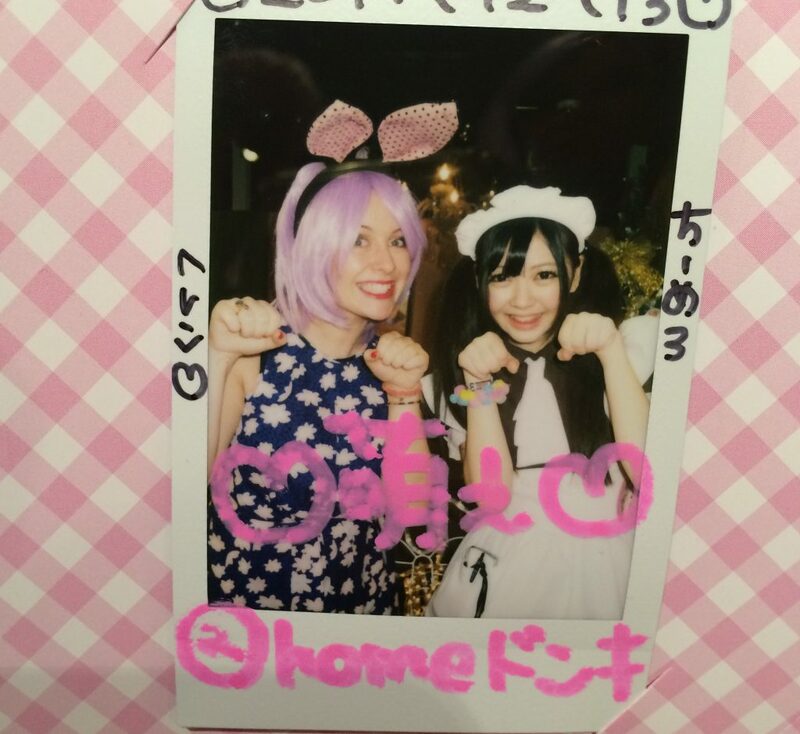 But, a cooler and way more authentic way to embrace the nightlife in Yokohama is in the Noge area. The hidden back streets are full of cute bars, jazz clubs and cafés with a more bohemian feel. Not much has changed since the 60s and 70s and during the day the area is also a top spot for shopping. Take the JR Local or JR Rapid train from Sakuraicho station via Hachioji (which takes just over an hour), and then it’s the same line from Hachioji to Matsumoto, taking 2hrs. Two weeks isn’t that much time to fit in a whole Tokyo Kyoto Osaka itinerary as well as some of the other key stops on our trip around Japan. We decided not to spend the night in Matsumoto as we had booked to stay at a Ryokan in the mountains that evening. But, taking an early train from Yokohama, we arrived in Matsumoto around 11am so we had a whole day to explore. One of the great things about train stations in Japan is that they have an affordable locker system where you can store your suitcase or backpack when you want to stop and explore a place en route to somewhere else. After securely storing our luggage at the station we headed out to see a bit of Matsumoto. Sadly, when we were there it rained the whole day but we still had an enjoyable time wandering along the river and ducking into traditional shops and cafes to dry off and warm up with a cup of tea. In Matsumoto’s historic downtown area, along Nakamachi and Nawate Streets, traditional industrial warehouses have been converted into shops and modern restaurants and the vibe is upbeat. 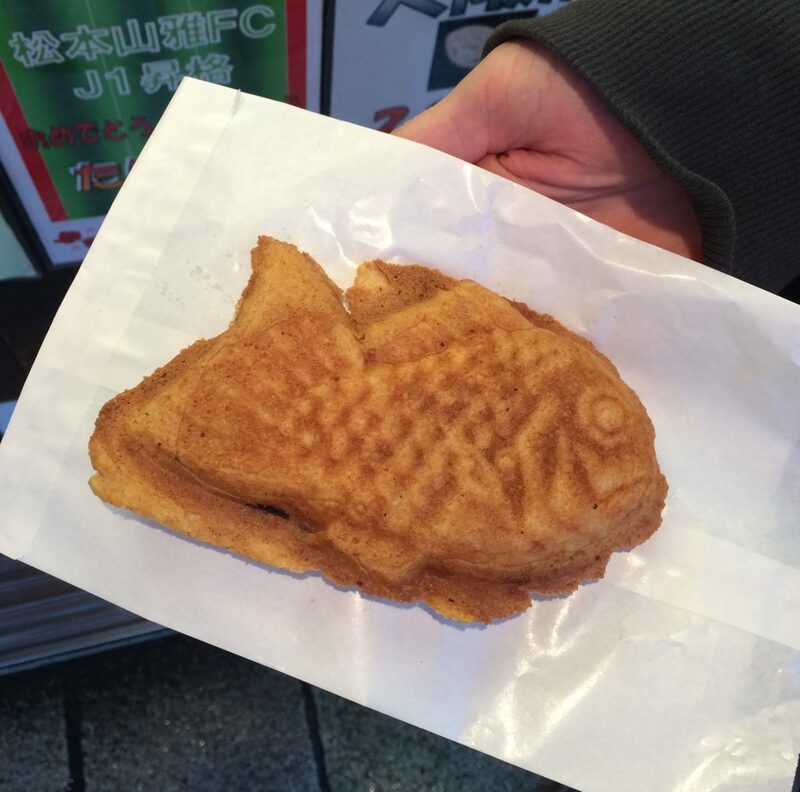 One of the famous things to eat in Matsumoto is the Taiyaki ( or’fish waffle’ as we were calling it). It’s famous for being a fun, childhood treat in Japan and is essentially a waffle that is shaped like, but doesn’t taste of, fish. The traditional filling in Azuki red bean paste but you will also have the option of custard, chocolate or savoury fillings, such a cheese. They are delicious – especially on a cold day! Lots of places sell them but we found a cute ramshackle cafe along the canal, run by an old lady that was really friendly and welcoming. 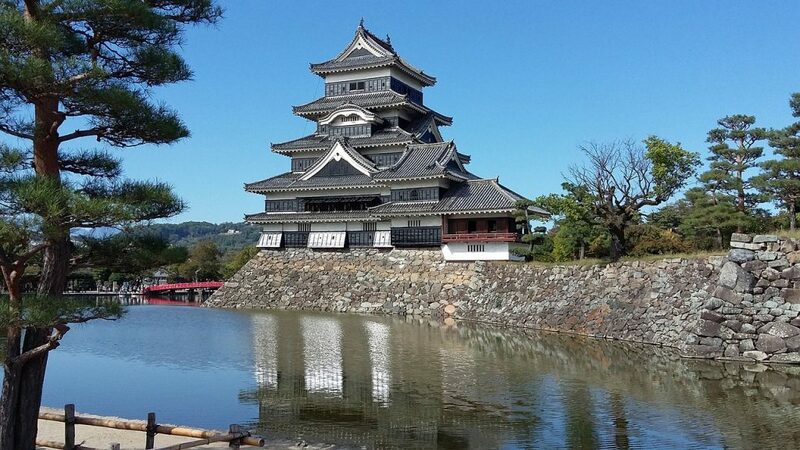 The other big attraction for tourists to do in Matsumoto is Matsumoto Castle. This ancient castle donjon is the oldest in Japan and was built in 1592. It is a very beautiful, yet imposing, castle sat in the centre of a koi-filled lake. You may also hear it referred to as Crow Castle because the black winged architecture but it is very beautiful. You can tour the Matsumoto Castle (entry is £4) and get spectacular views of the mountains from the top mezzanine. In the afternoon, we began our bus journey from Matsumoto bus station on the Alpico bus service to Shirahone (£11 each way) to stay at a forest spa hideaway called Awanoyu Ryokan. Shirahone is a small remote onsen village hidden in a valley at the foot of the North Japanese Alps. The journey, by coach, would usually take around 1hr 10 mins but visiting in the winter we ended up battling some major snowfall! Before long, our coach had to stop and smaller, mini van taxis were sent down from the onsen to collect passengers and take them to their destination. 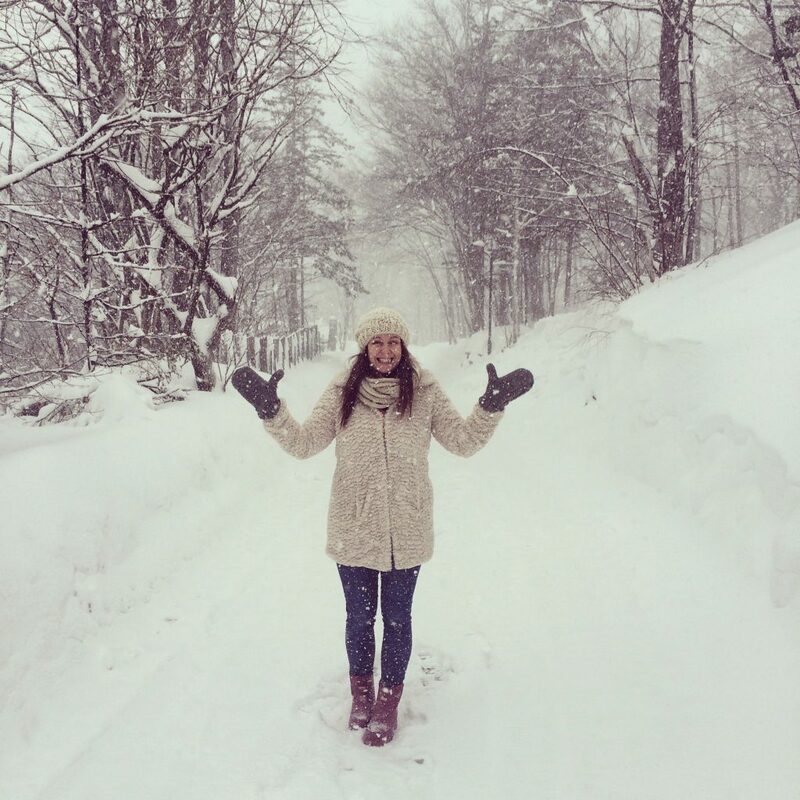 The snow fell so fast as we travelled along, it was thrilling but slightly scary – definitely an adventure. 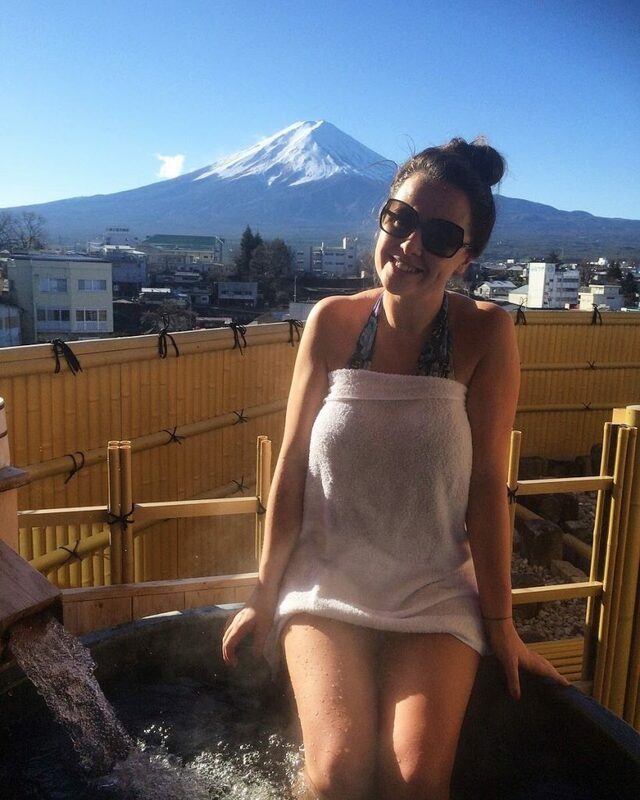 Read a detailed post about the journey and our experience at the onsen here. For those familiar with the geography, Shirahone is close to popular skiing spots Kamikochi and Norikura. Known for its healing waters, Shirahone literally translates as ‘white bones’, named after the milky colour of the hot springs in this area, which have naturally high calcium and magnesium content. The area is also incredible for beautiful hiking and wildlife spotting, including the magnificent Jigokudani Snow Monkeys. In sping, the entire landscape is freckled with pink cherry blossom, changing the way it looks completely. As you will see from my post on Awanoyu, the weather was intense so we didn’t stray far from the Onsen but it actually gave us a good excuse to rest and take it the wonderful experience we’d had in Japan so far. Take the coach back to Matsumoto (taking just over an hour). And then board the local JR to Nagoya, which takes 2hr 20mins. From there you can take the Shinkansen Hikari line (bullet train) all the way to Kyoto, taking a further 45 mins. This was one of our longest journeys but we had really comfortable pre-reserved seats on the train and the scenery was fantastic. To make a seat reservation, go to the station booking office before your trip (we booked ours when we arrived in Matsumoto originally) and you are given a ticket that goes along with your JR pass with carriage and seat reservations on. There is no extra charge for this. This is another type of accommodation experience you can have in Japan. Kyomachiya are traditional Kyoto-style houses and this one, Gion-Kinpyo, takes only one group a day so we had the cottage to ourselves. The hosts are lovely (and I think live in a different part of the house). We slept in a loft-style room with three futons in that had been pre-set up for us and we had two bathrooms and a living area with books and sofas to chill on. We were offered green tea and Japanese snacks when we arrived and the Kyomachiya is on a quiet residential street, walking distance to Kyoto’s main tourist areas. We booked the Machiya Townhouse (with hinoki bath), £249 per night, split between three people. One of the things I love about Japan is how it can feel both modern and ancient at the same time. Nowhere does this better than Kyoto. The ancient Japanese capital is the most traditional or classic place we visited in Japan. It really felt like going back in time and one of my favourite teenage books, Memoirs of a Geisha, quite literally came alive in front of me. It really does feel like a magical place. But, of all the cities we visited, Kyoto was very user-friendly for non-Japanese speaking visitors. Through the 300 year old streets there was a – dare I say it – almost Disney-esk organisation about it. I felt like I always knew where I was going and a lot of the shops and restaurants had English menus or product descriptions. For the traditional Kyoto streets, the area of Gion is known as the geisha district and is very Instagrammable with it’s narrow streets and wooden houses. You may see real Geisha walking around and you shouldn’t just randomly take photos of them from the front because it’s rude to just photograph another person without asking – even if they are wearing beautiful robes and makeup. You also find a lot of locals who wear the Geisha gowns and have no problem posing for photos. Most of whom are not traditional geisha but who is going know? You gotta get a photo, right? 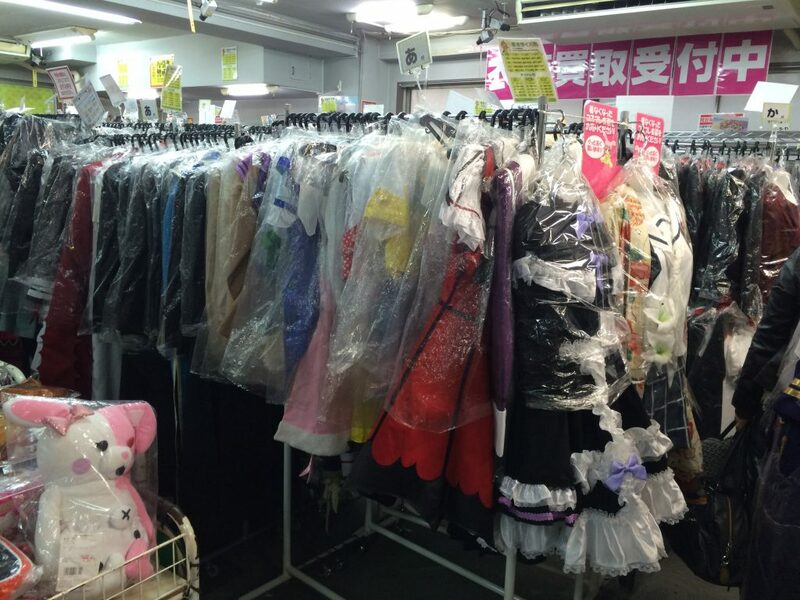 You can actually rent a Kimono for a day if you want to too! It’s not cheap though, £30 for a package that includes robes, shoes, hair and makeup plus a professional photo. 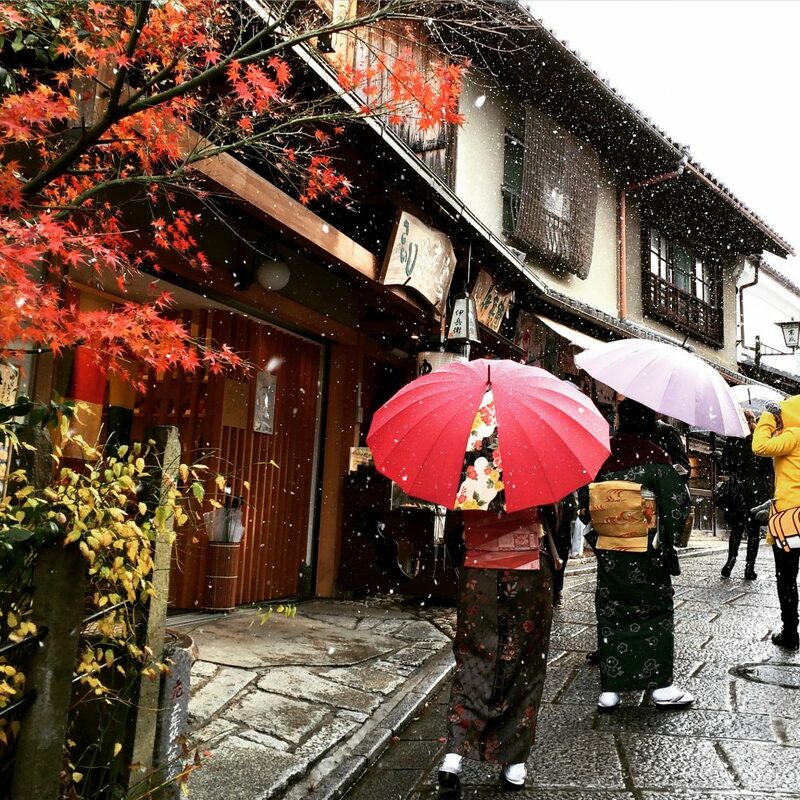 Being all ancient and beautiful, Kyoto is also the place to go for temples. They have giant ones, ‘love’ ones, traditional Buddhist retreats and glitzy ones covered in gold – take your pick! We only had two days for our Kyoto itinerary, so we opted for the Kiyomizu Temple and the Kinkaku-ji. Get your walking boots on because to reach Kiyomizu-dera you have to walk up a pretty steep hill but it is worth it for gorgeous views across Kyoto. The steps that lead up to the temple are lined with gift shops, tea shops (it’s actually called teapot lane), random stores and stalls, so you can take it slow. The temple itself isn’t a tranquil shrine, and is always populated with tourists, but it does offer an example of how Buddhist temples are and an opportunity for outsiders to learn about the culture. Kiyomizu-dera is also where you can do the ‘love walk’. No it isn’t a funky dance, the Jishu Jinja shrine is the shrine of the Love Bond God and those who worship the shrine are said to be lucky in love. It’s really cheesy and touristy, but a lot of fun! There will probably be a small line but the atmosphere is jolly and everyone waiting in line cheers on the walkers. To do the love walk, you have to walk slowly between two sacred rocks with your eyes closed. If you reach the other stone safely without opening your eyes, your wishes for love will be fulfilled. If you don’t believe in any of that stuff, it’s just a fun game to do with your friends! Get into the spirit of it all. The rest of the temple is worth exploring but get there as early as you can as it gets very crowded in the afternoon. The Grand Hall has been under construction for a few years but is due to open in March 2019, so if you are visiting during the Rugby World Cup 2019, it’s a fantastic time to go. Don’t forget to stop at the Otowa waterfall, under the Grand Hall, which cascades into a pond. 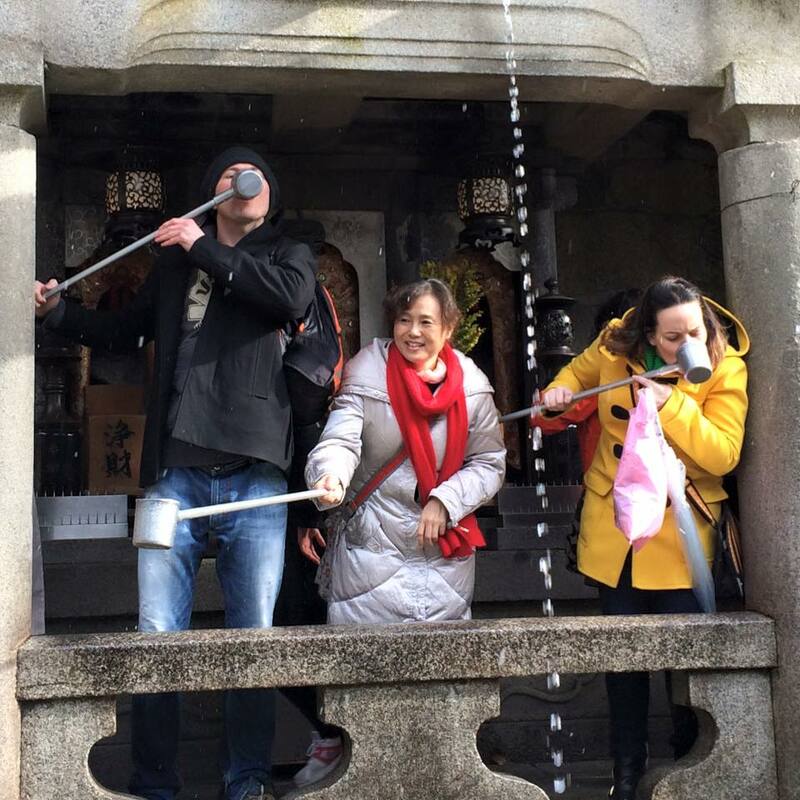 Visitors are invited to collect and drink the water and make a wish. 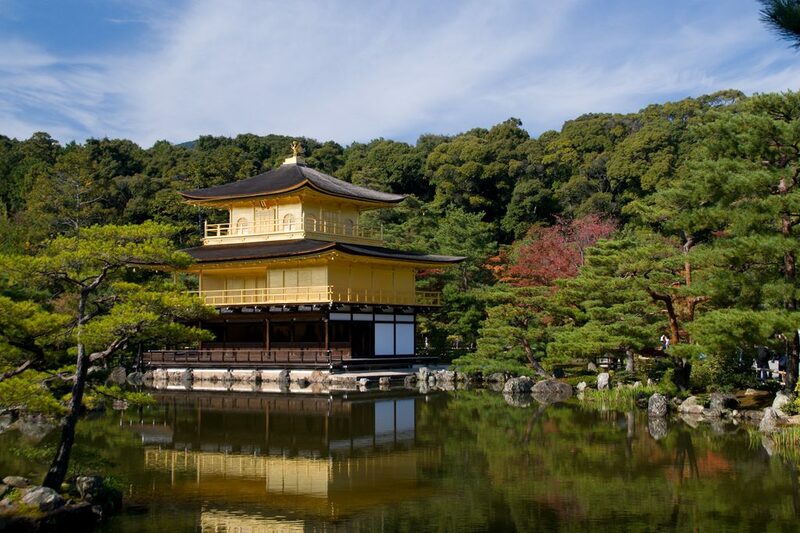 The other temple worth a trip is the Kinkaku-ji, Kyoto’s famous Golden Pavilion. The temple is actually not ancient at all – in fact, it was rebuilt in 1955 from the original 1397 design after it was deliberately destroyed in a fire. 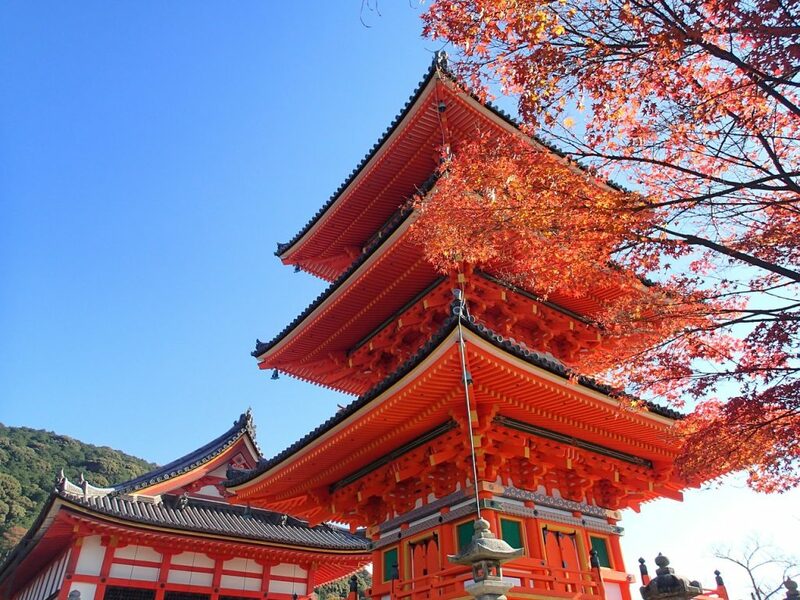 The temple, which is beautiful to look at, especially when it is sunny, is one of the best Instagram spots in Kyoto. If, like me, you usually only pray at the alter of food and drink, a must-visit spot in Kyoto is the comically named ‘Spicy Street’. The closest translation from the Japaense ‘Gekikara Shotengai’ to English is ‘Super Spice Shopping Street’, which basically explains all you need to know. Located in Muko town, west Kyoto, lunch here is going to be hot – think, habanero ice cream and pancakes cooked at spice levels between 1 and 5… (don’t even think about 5). 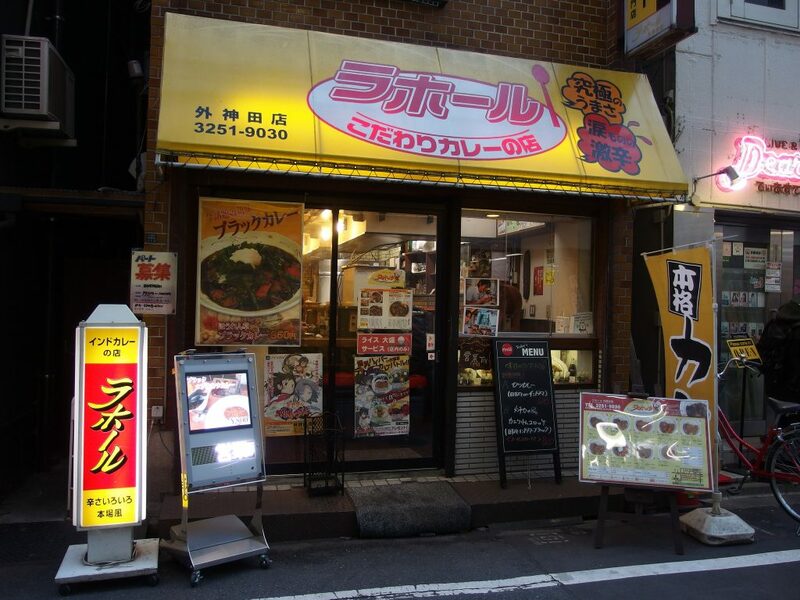 The best thing to eat on Gekikara Shotengai is the ‘Sudden Death Dog’ a curry crepe from a stall called ‘only’. You’ll see it. Signs are everywhere. With most Japanese food, especially in traditional Kyoto, not known for its spicy flavour, this is a unique lunch joint for spice fans! 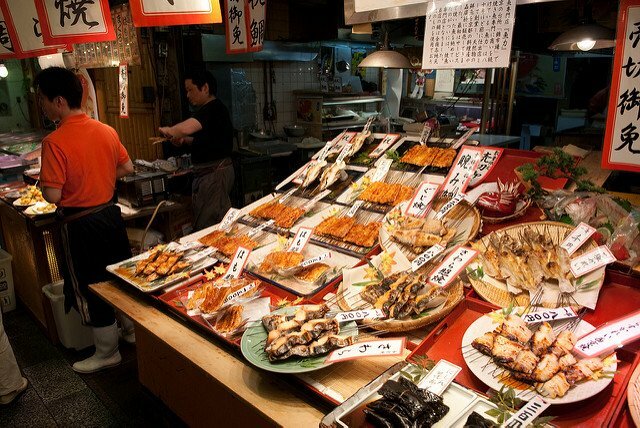 The other, great place to try a range of local Japanese street food is Nishiki market, a great budget dining option in Kyoto with some interesting bites to choose from. Another place to delve deeper into Japan’s interesting heritage is at the Gekkeikan Okura Sake Museum. This distillery hasn’t changed in 400 years and still makes sake the traditional way. Try a few different options and find out what blend you find most palatable. I really felt like Kyoto was a safe place to walk around at night. There were always plenty of people around and it was calmer and less neon than Tokyo and Osaka. 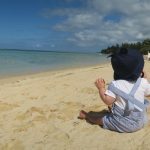 There are a lot of tourist bars – we admit, a bit over the fish and rice diet (the Japanese eat fish and rice for breakfast too!) we succumbed to the delights of a good old pizza place and a bottle of red wine. For dinner, there are lots of restaurants that look over the river but be sure to check the menu because we found some to be extraordinarily expensive, clearly taking advantage of the constant flow of tourists. After a while, getting bored of walking around to find somewhere, we ended up in a tiny restaurant on a side street. It was not a tourist place at all – the staff had absolutely no grasp of English at all and no international ‘photo’ menu (which is common) – but they encouraged us in and were so friendly. It did mean that we just had to point at something on the menu and hope it wasn’t sea urchin but that was part of the fun. After dinner, the group at the next table sent glasses of sake to the table for a toast and it was all rather lovely. And no, we didn’t end up eating anything weird. For a very cool, very hipster, bar to get a good cocktail, look for the ‘magician bar’ or by its actual name, L’Escamoteur’. It’s a small, friendly cash-only bar with an international feel in Shimogyo. Exquisite cocktails are around £9. Everyone has seen the photos – it’s on the cover of the Lonely Planet Guide Book for starters – but that doesn’t stop the real deal being incredibly impressive. 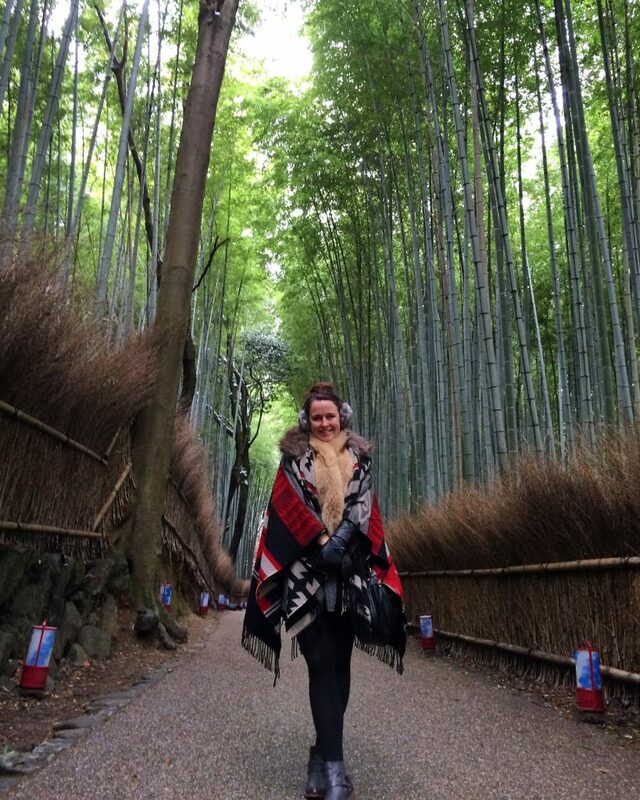 The Sagano Bamboo Forest, in Arashiyama has rows of giant bamboo that you can walk beneath and genrally feel dwarfed by. There isn’t much to do here except look at the bamboo but it’s genuinely like nothing I have ever seen before. This is one place I do recommend settling the alarm for. We didn’t get there quite early enough and so it was pretty busy with tourists by the time arrived. I would like to go back and I would definitely get there first thing in the morning, preferably before the sun rises to get some amazing photos. 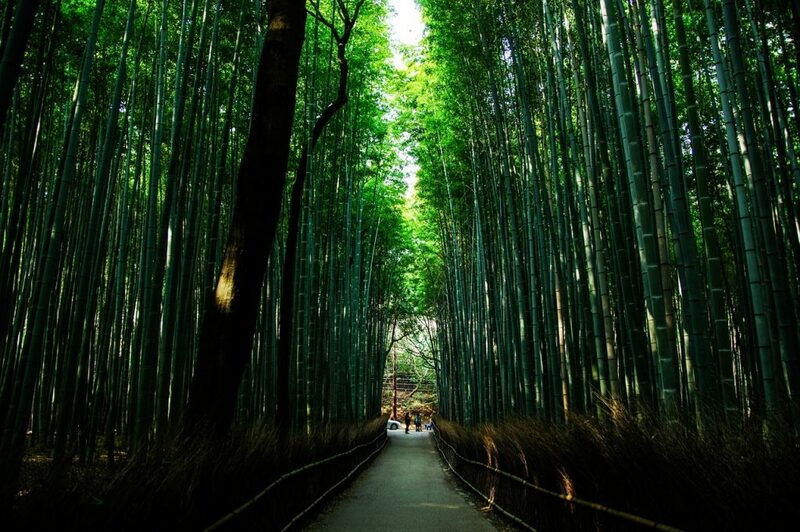 To get to the Bamboo Forest from Kyoto, travel on the JR Sagano Line from Kyoto Station to the Saga-Arashiyama Station. The train takes around 15 minutes and then there is a short uphill walk to the forest. The town of Arashiyama is pretty cool too and definitely one of the more chilled out, fun places to wander around. It reminded me Bali, strangely enough. The Fushimi Inari-taisha Shrine is another of Kyoto’s must-see (and photograph) attractions. It’s also known as the ‘fox shrine’, due to the 50+ statues of foxes erected there. Originally dedicated to the god of rice and sake by the Hata clan in the 8th century, a path of 5000 vibrant orange torii gates wow you as you make your way through the shrine. Because there is so much vibrant red going on, you may be forgiven for missing the foxes at first but they are significant because in Japanese folklore, the fox is seen as the messenger of the god of grain foods, Inari. Osaka was such a joy! I often cite Osaka as being my favourite place in Japan but I think it’s just because I arrived and everything I expected Japan to be was right there in front of me. Even though we had already been to so many inspiring places in Japan, the vision I had in my head of what it would be like was exactly as Osaka is. I found Tokyo more manicured and European than I expected. There were French bakeries and international restaurants and brands everywhere. 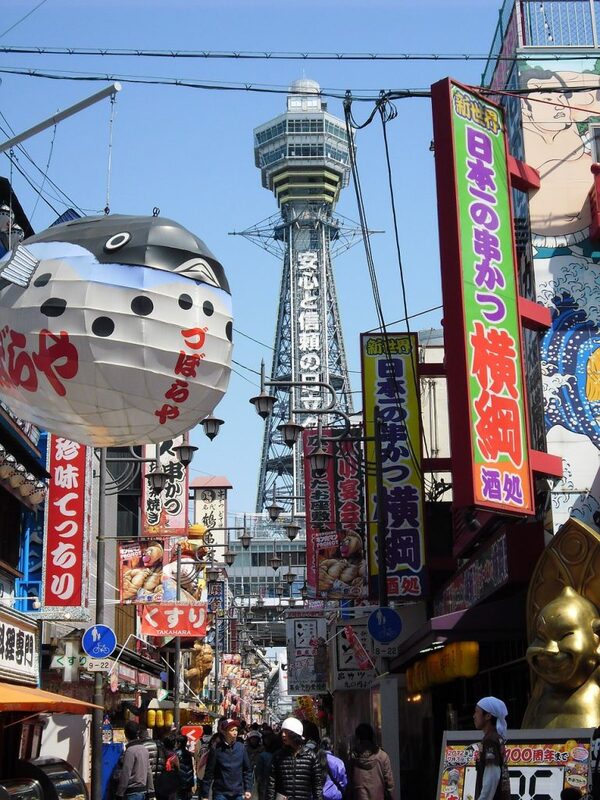 Osaka is just unapologetically Japanese in all its brilliant glory. Neon lit streets, hole in the wall sushi bars, whisky dens, mad clothes shops and heaps of character. I just loved it. Osaka does have its own very impressive castle, but to be honest, having spent a few days touring temples and shrines in Kyoto, we were looking for a different experience here. Osaka has been quietly building a name for itself as a top foodie destination and I was surprised to find the city has 212 Michelin Star restaurants. We didn’t quite have the budget for fine dining so we headed to the best place to eat in Osaka – Kuromon Market. 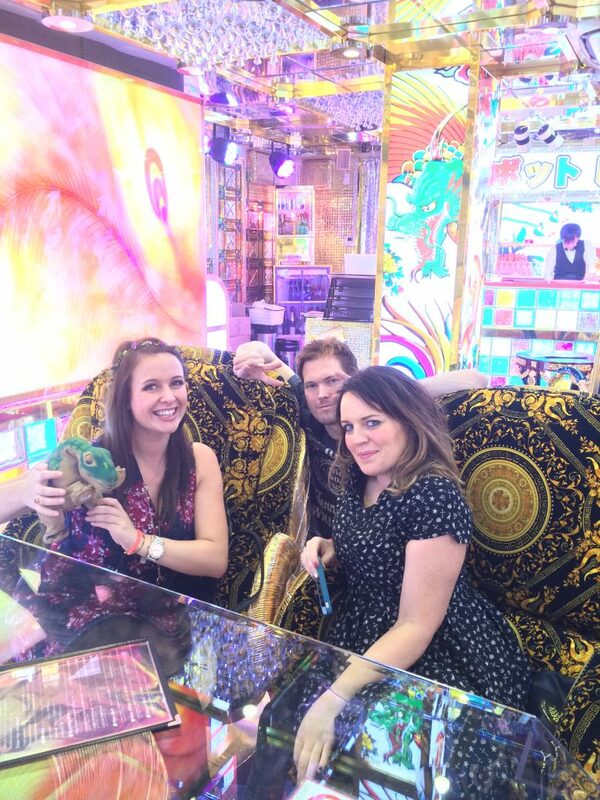 This indoor makeup is a seafood emporium serving some of the freshest sushi and sashimi we had in Japan. Another popular offering is the giant crab legs, which you can have chargrilled. Fish isn’t the only food served at Kuromon Market, you can also sample the local delicacy of takoyaki octopus balls or pork okonomiyaki, a form of pancake. It is also a great place to pick up holiday souvenirs, T shirts, weird trinkets and postcards to send home. Later, head to Dotombori, the area which just screams Japan in every way. This is also a top foodie area in Osaka but it really comes alive at night when the neon lights are flashing and the street sellers roll up with carts, selling tasty street food. There are bars and restaurants galore along here and it’s pretty much buzzing all day. 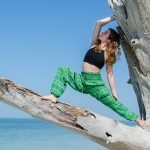 You may have noticed that, unlike most of my destination posts, I haven’t sent you to many specific restaurants or bars, unless they are slightly more well-known and therefore easy to reach with a GPS or map. That is because many restaurants and bars in Japan don’t have English names and so it is near on impossible to recommend specific places. The good thing about nightlife in Japan is that once you decide on an area, there is a lot of choice in the same place. 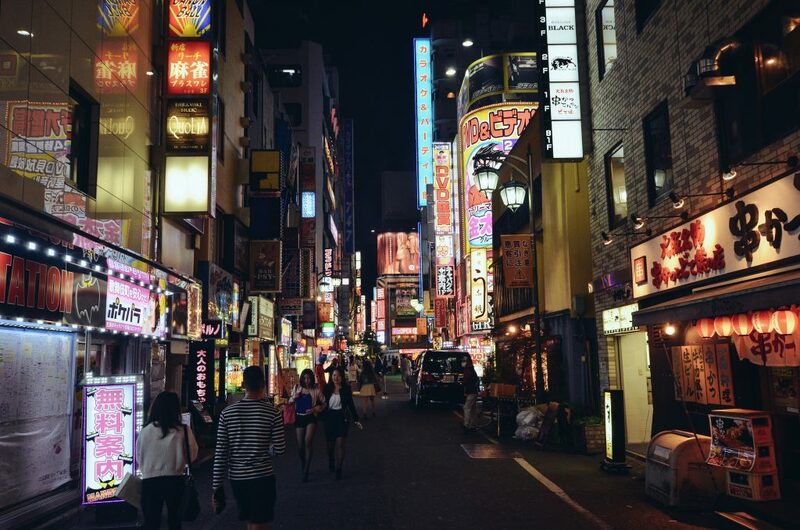 From our experience, Osaka had the best nightlife in Japan but you really need to get out there and explore for yourself. It’s extra friendly too and both nights we went out in Osaka, someone (usually an in-the-know backpacker or a local student with good grasp of English) would befriend us and lead us to a fun place to get a beer. From karaoke bars that appeared to be hidden inside office blocks, to nightclubs in houses and random pop-ups, I don’t think you could ever run out of things to do in Osaka at night. Osaka’s version of Shinjuku’s Golden Gai district is the Misono Building, a former office block which how has a ‘secret’ floor containing micro-bars. There’s a really authentic atmosphere and, frankly, it’s just downright cool. Got time for a bit of magic? 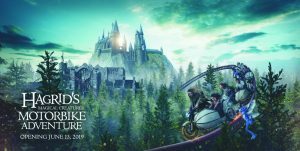 Did you know that Universal Studios Japan, featuring The Wizarding World of Harry Potter, is only 12-minutes from Osaka Station by train? 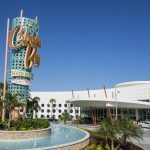 We didn’t have time and have also spent a lot of time at the park in Orlando, Florida, but it’s good option if you are visiting Osaka with kids (big or small). If you’re not too worn out, Osaka is a great base in which to take a few day trips to see a bit more of Japan while you can. 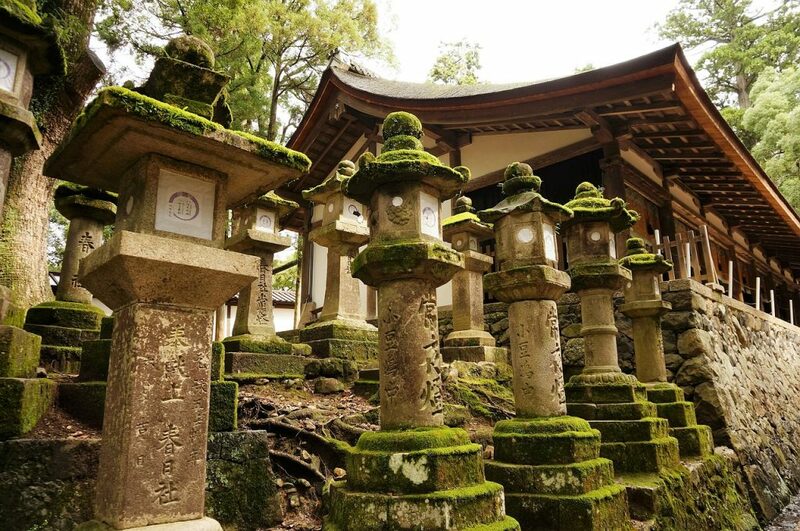 One of the best day trips from Osaka is to Nara – a collection of eight Unesco World Heritage Sites. Nara is located in the south-central Honshu and only under an hour from Osaka by train. When you get to Nara, first stop should be the Tōdai-ji a Buddhist temple that houses the world’s largest bronze statue of the Buddha Vairocana, known in Japanese as Daibutsu. Adjacent to the temple is Nara Deer Park. The park, which is part of the temple grounds, has over 1,000 wild deer. It’s not a petting zoo or wildlife park but you can buy food to feed the deer and they have no problem coming over to say hello and eat out of your hand. You might even see some deer roaming around in the town too as they are quite mischievous and apparently love the company of humans. 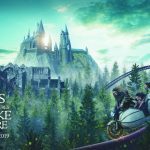 This is a great day trip from Osaka if you are travelling in Japan with kids. To get to Nara from Osaka, take the local JR Yamatoji Line from Osaka Station to JR Nara Station. The trip takes around 50 minutes. 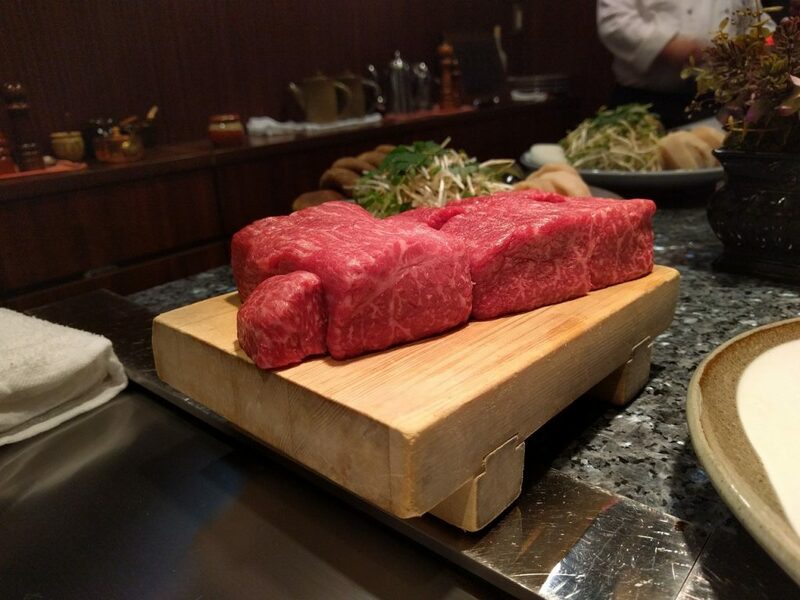 This year, Kobe wont just be known for producing the ‘best beef in the world’ it will also be one of the key venues for the Rugby World Cup 2019 and so it’s definitely worth jotting down a couple of key tings to do in Kobe. 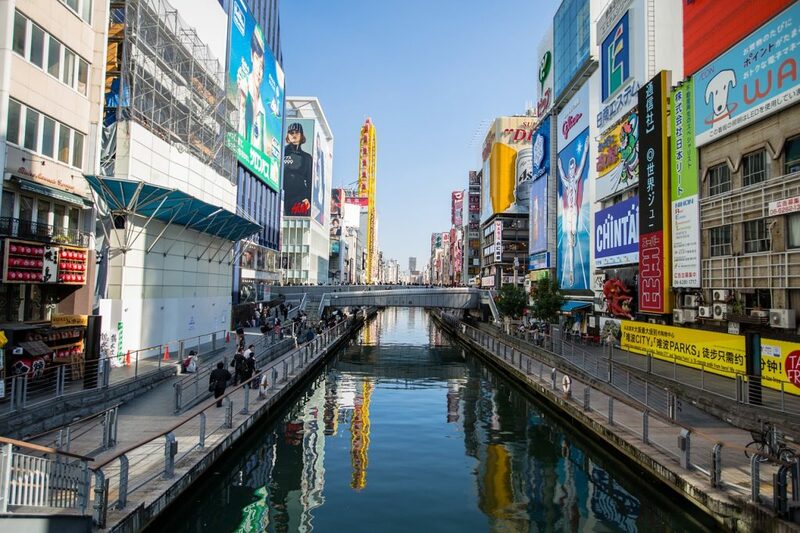 If you are headed to Kobe for a Rugby World Cup match, I would recommended choosing accommodation in Osaka, which has a lot more vibrant nightlife and things to do for a longer period. Kobe is a really short 20 minutes train ride from Osaka. The impressive Mt. Rokkō looks over the city, which wraps around Osaka bay. You can take the Shin-Kobe Ropeway cablecar to a vista on the mountain and the views across Kobe are sensational. We went in the daytime but the observation deck is also a popular activity to do at night in Kobe. The cable cars pass the Nunobiki Waterfall and the Nunobiki Herb Garden, so in daylight you should get a good view of each. For decorative and ornate flower beds, take a walk down Flower Road in Sannomiya. As well as the floral treats, this is a great area for shopping with a huge mall that actually continues underground, under the city. Where to eat Kobe beef in Kobe? Okay, so in case you don’t know. Kobe beef comes from a breed of cattle called wagyu, rainsed soley in this part of Japan. There is a complex rearing process that involves massaging the cow and feeding the cattle beer, resulting in soft and tender meat. Hungry yet? Wagyu beef is said to be the best in the world so if you are in Kobe for the World Cup then you have to try a bit. Said to be the best beef in the world. The place to chomp on a plate of Kobe beef in Kobe is Wakkoqu, often tipped to be one of the best. Chef will cook your meat to order at the table. For the most affordable way to eat at Wakkoqu, go for lunch and choose the set menu which serves delicious steak with soup and vegetables. Lunchtime special is around £45 per person. The more ‘millennials’ place to sample the beef is at the laid back Wanto Burger. The diner-style restaurant is one of the cheapest places to try kobe beef in Kobe without sacrificing on quality. Perfect for a bit of post-match grub. To get to Kobe from Osaka, don’t bother with the bullet train as he station is much further out of town. Take the JR Special Rapid Train from Osaka Station to the Kobe Sannomiya Station, the local train only takes 20 minutes. Should you go to HIROSHIMA? From Osaka you can travel to Hiroshima on the super speedy Shinkansen bullet train with your JR rail pass. Take the Sakura Line from Shin-Osaka Station to Hiroshima Station and it takes around 1hr 30mins. Unless you area headed in that direction anyway (some of the Rugby World Cup home nations games are being held in Kumamoto and Oita on the Japanese island of Kyushu, which is below Hiroshima), have a lot of time in your schedule or a real interest in the history of the site, I wouldn’t urge you to go to Hiroshima. Of course, the site has important significance and seeing the Atomic Bomb Dome in real life is quite a shocking reality check. But Hiroshima is a detour from the general Tokyo Kyoto Osaka itinerary and I personally didn’t think it was worth the trip. 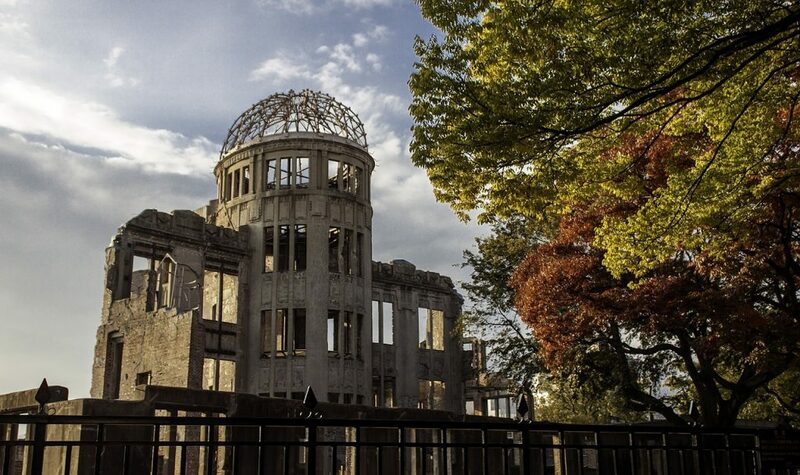 There isn’t much else to do in Hiroshima besides visit and tour the bomb site and it’s quite a depressing place. The Hiroshima Peace Memorial Museum has an interesting collection of possessions retrieved from the bomb site, including melted children’s shoes and burnt school books but the display has some upsetting exhibits such as mannequins with their fingers and faces melted off to depict the horror. I found it extremely graphic and I definitely would not take children here. The other slightly questionable thing about the museum is their take on the well-documented lead up to the bomb and that they conveniently left out any wrong-doing or blame by Japan, depicting themselves as innocents in the war. To be fair, it was less opaque, but I felt similarly about the USA’s version of events when I visited Pearl Harbour in Hawaii so… I think I’m just going to stay out of that one! The journey back takes slightly longer as you can’t tale the Nozomi trains on the Tokaido Shinkansen Line on your JR rail pass. You have to take the Hikari and Kodama trains on the Tokaido Shinkansen line, which are covered by the Japan Rail Pass, and they take between three and four hours. Back in Tokyo, we took a chance to get a better feel of the city. 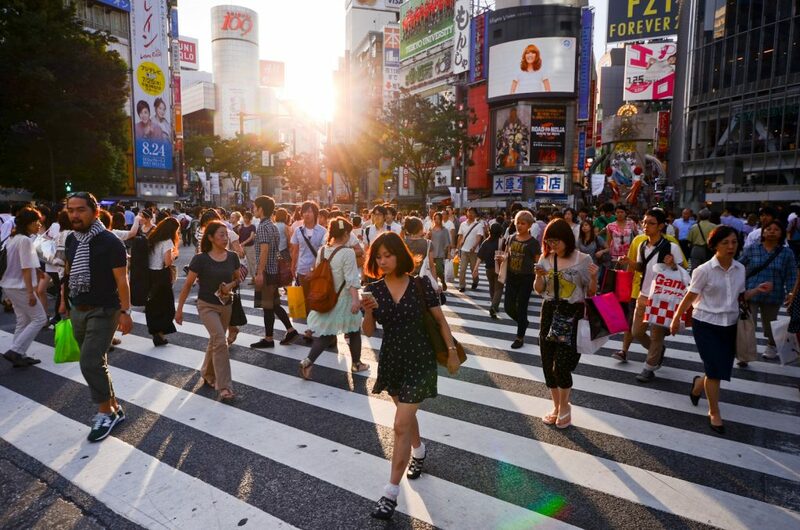 Tokyo is similar to London in that it is made up with a jigsaw puzzle of different areas and communities and each one has its own personality. Start in Asakusa, Tokyo’s most spiritual district. You can pay a visit to the famous Senso-ji Temple before having lunch at Nakamise, a small street that runs from the front gate to the main hall of Sensoji temple. This collection of local shops and food stalls is a cute place to spend the morning. 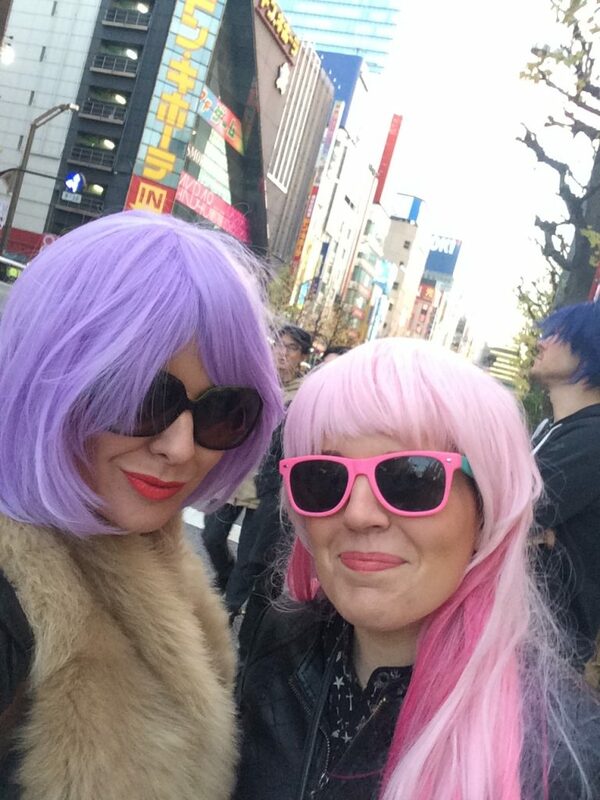 In the afternoon, embrace your inner geek and go full-on cult Japan in Akihabara. This is the epicentre of Tokyo’s geek culture and shops have all the latest gadgets, electronics, computer games, manga, collectables and toys. This is also where you will find the extra weird ‘maid’ cafes. These are, essentially, odd establishments where of-age women in pigtails and school uniforms wait on guests (mostly men) by giggling and calling them o-shujin-sama (master). Food basically consists of rainbow coloured mush with faces stuck on to it. It’s certainly an experience, that’s for sure! In the evening, Roppongi is tipped as being Tokyo’s most popular nightlife district for international tourists. 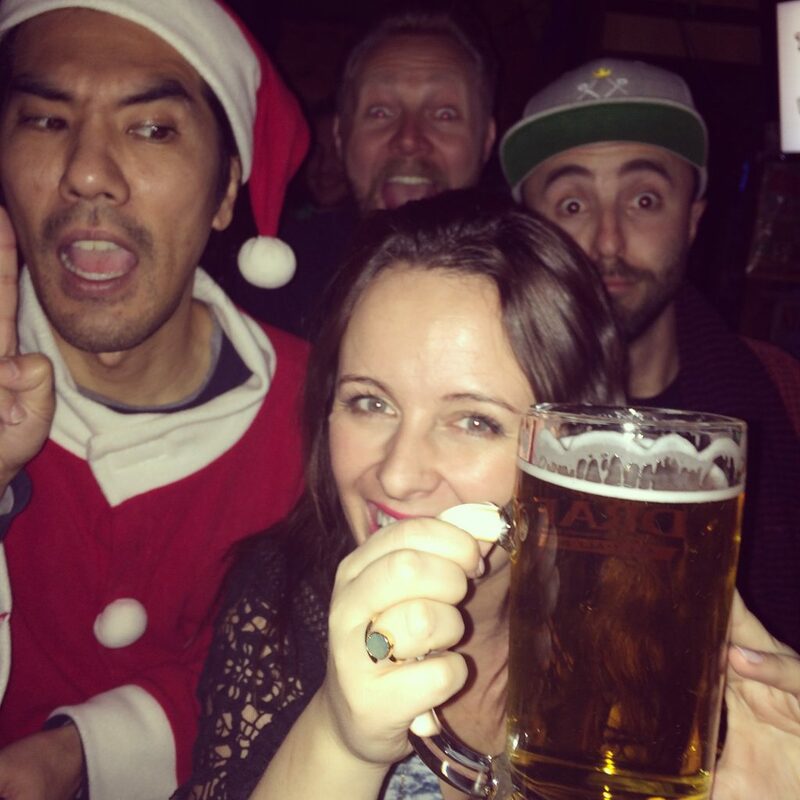 We have to admit though, we had such a great time in the Golden Gai last week that we went straight back there and had an equally good time. 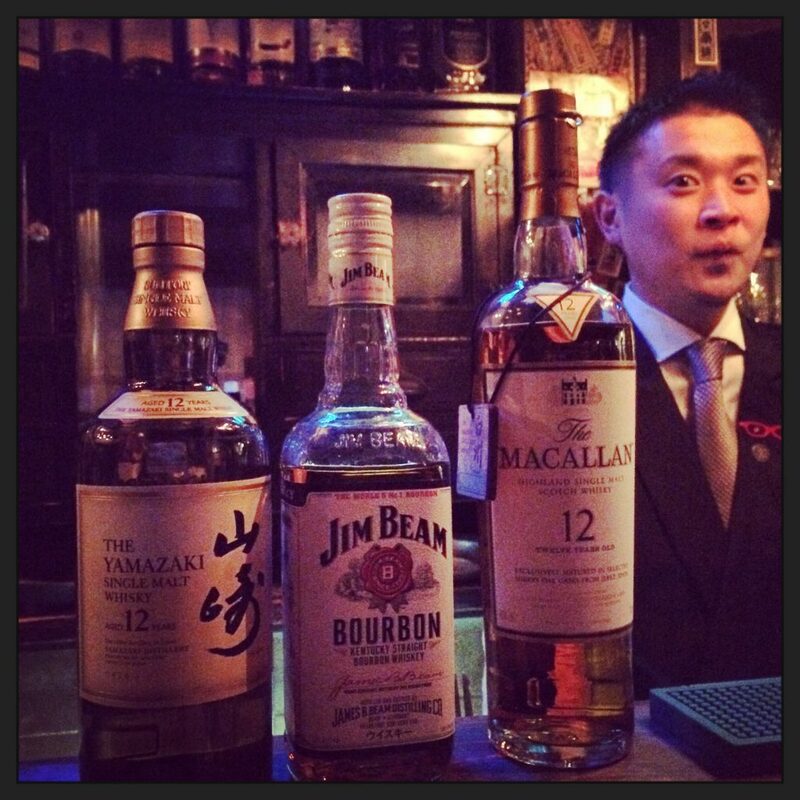 We met a local couple in a tiny whisky bar and then invited us to a Bar Champion with them. It’s kind of a mix between a rowdy Irish bar and New Year’s Eve in a working men’s club – aka, brilliant! It was our last day, so we spent most of it packing up and doing some clothes and souvenir shopping at the beautiful Mitsukoshi, Japan’s oldest department store. I also went back to Yanaka Ginza, a manicured shopping street that had some wonderful vintage boutiques and clothing stores. With a fortnight of culture and fascinating people and places to absorb, we had seen so much of Japan’s incredible, unique beauty. 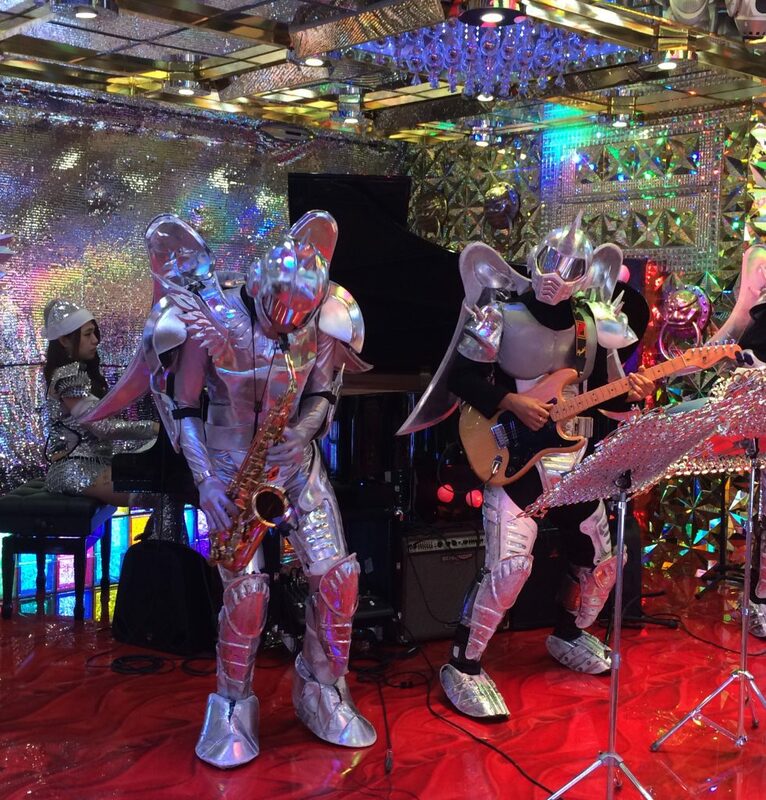 However, we could not leave Tokyo without going to the famous Robot Cabaret or better known as the Tokyo Robot Restaurant. We debated whether or not to go to this famed Shinjuku restaurant but, it had been a dream trip to Japan and we had never done anything like this before. It’s certainly not cheap. £65 for the entrance fee and your meal and the food is truly awful, so don’t expect much. 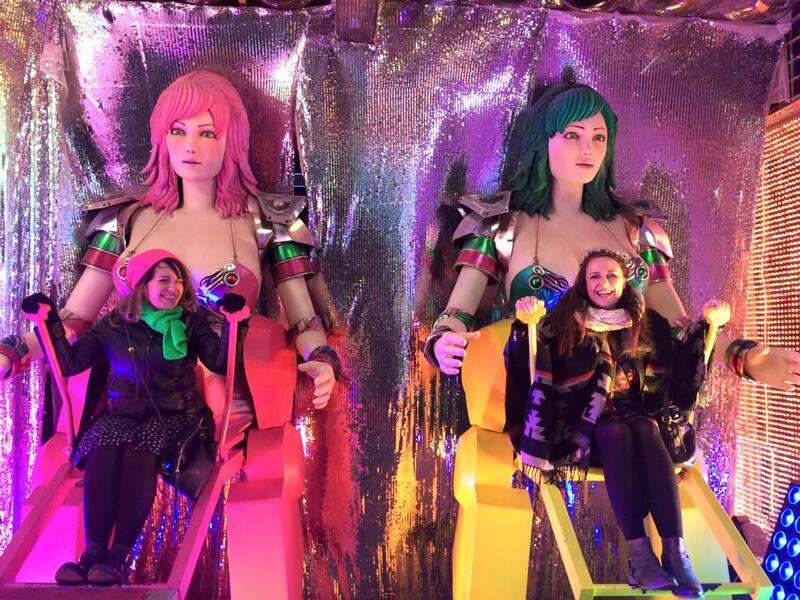 Robot Restaurant Tokyo tickets can be purchased in advance online or on the door and you can save money by booking in advance. I’m not sure whether to advise you to go or not. 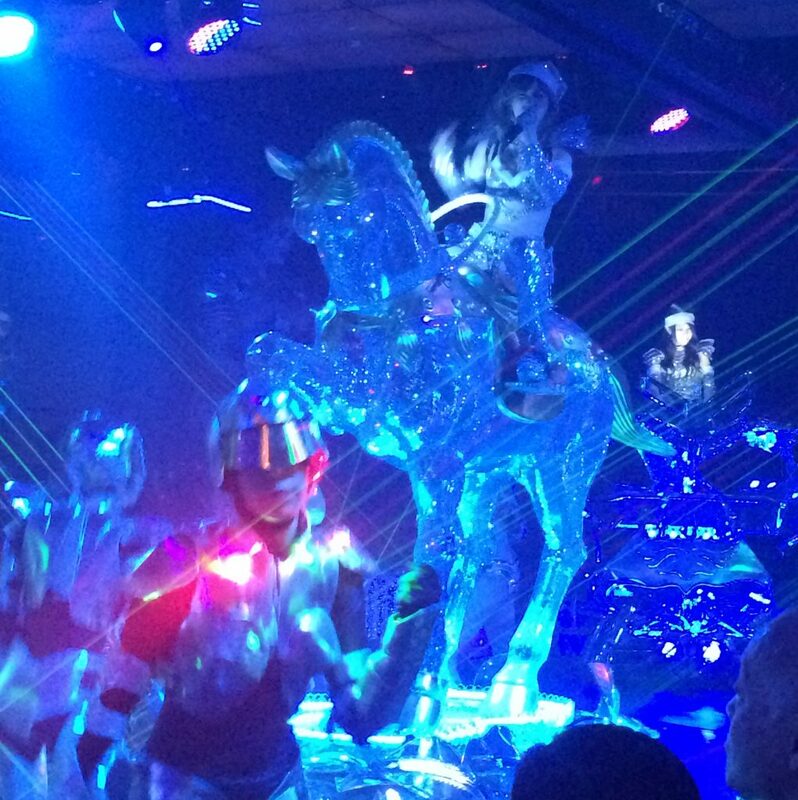 Well you’ve read my robot restaurant review above… if you think you might need to see it for yourself, go for it. It’s certainly a once-in-a-lifetime experience! 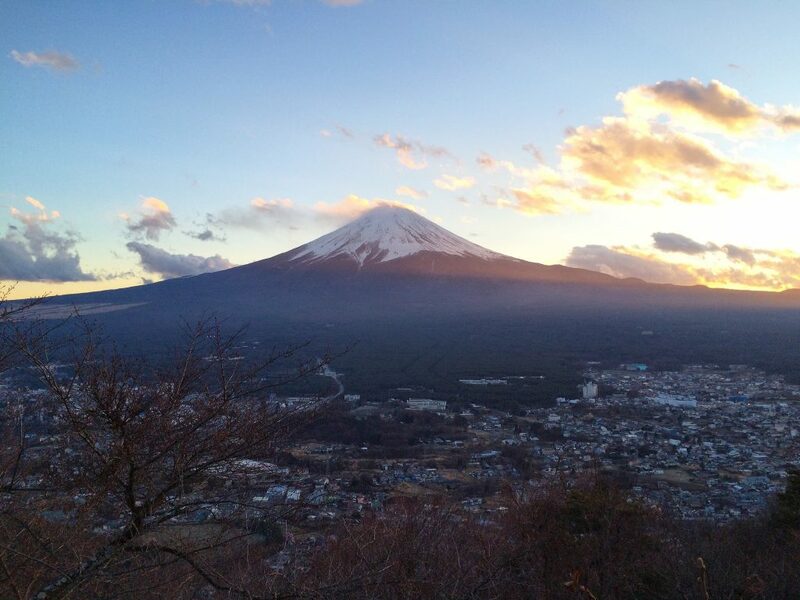 As for Japan – you should absolutely go and see this incredible country. There was so much we didn’t see (and eat) that I can’t wait to go back and do it all again. This Tokyo Kyoto Osaka Itinerary is a great place to start if you are visiting Japan for the first time. If you are in Japan for the Rugby World Cup 2019, with many of the matches being played in the cities I’ve mentioned, you should have no problem finding some brilliant things to do. Follow us on Facebook for inspiration or to ask us any questions. 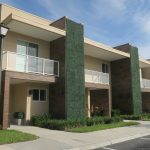 We are also on Twitter and Instagram.